Having learnt his trade working for his father, Hector launched his own tailoring company in 1908 in Bishopsgate, London. Development of the Hector Powe business was halted by the First World War, as Hector joined the Army. After demobilization in 1919, he returned to London with fresh ideas about the nature of his designs. Hector felt that men’s fashion was ripe for change after the War. Men, and more importantly, their wives and girlfriends, had become accustomed to the athletic, more masculine lines of service uniform. They did not want to return to the narrow, cramping style of the pre-1914 era. So Hector endeavoured to provide gentlemen with a more stylish silhouette, and to reflect the elegance of London’s West End, an area that set the tone for British fashion. Hector was then joined by his two younger brothers, Bertie and Leslie, which helped give the business a distinctly family feel. At this time the unique fit of the suit was what distinguished a Hector Powe outfit. 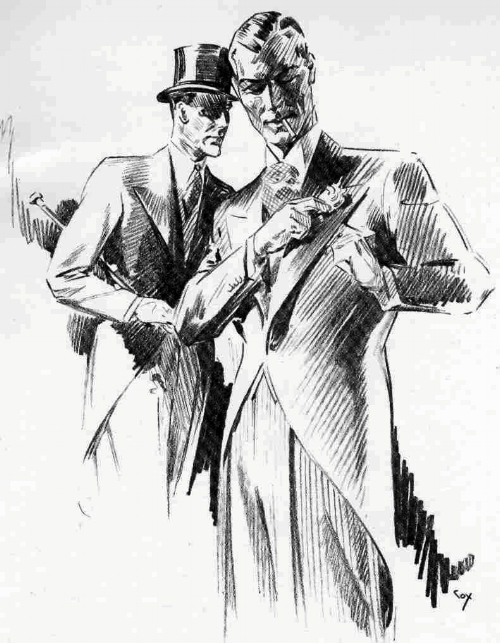 This was known as the 'HP Cut', a pioneering form of ‘New Tailoring' introduced in the early 1920s. As the Hector Powe reputation grew, so did the size of the operation, with new shops opening across London at the beginning of the 1920s and shops nationwide by the end of the decade. The three brothers were known affectionately as Mr Hector, Mr Bertie and Mr Leslie in their famous Regent Street Headquarters, from where they ran this ever-growing empire. As Hector Powe grew and diversified, it became synonymous with British quality. During the Second World War, they specialised in producing Officer’s uniforms. Their impeccable RAF Officers’ Greatcoats helped secure their status as a national treasure. This iconic association with British identity continued after the War, as Hector Powe was even commissioned to supply clothing to go under the early space suits for British astronauts. When an astronaut appeared on television or was photographed, a bespoke Hector Powe silk scarf had to be worn to conceal the neck fittings from rival space programmes. In 1958, three years after Hector’s death, Hector Powe was purchased by Great Universal Stores, before becoming part of the Burberry family. During this period the collaboration between Burberry and Hector Powe on iconic pieces such as the “mac” trench coat helped define the vogue identity of London throughout the 60s and 70s. Now, six decades after it was sold, the brand has returned to the ownership of the Powe family, as this fashion institution begins the next chapter of its extraordinary story. The enduring strength of the Hector Powe name is testament to Hector’s original vision for a family brand that could deliver beautiful clothing of inimitable elegance and quality. We remain deeply committed to these values and our modern collection of exquisite men’s accessories fulfils these heritage ideals.